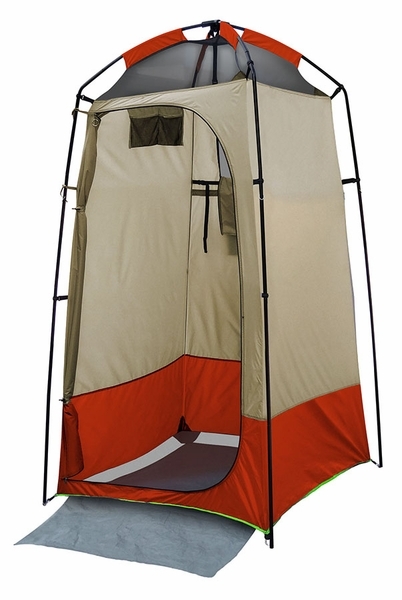 Peg: 4 steel peg 6"
Pack size: 26" x 8" x 8"
The Stinky Pete Deluxe Shelter has several uses; you can use it as a shower or toilet enclosure or as a portable changing room. A self draining floor allows water to run off and a mesh ceiling provides maximum air flow. The large D door provides easy access. The use of steel and fiberglass poles provides straight walls and plenty of head room. A rain fly on top keeps the inside protected and provides privacy. 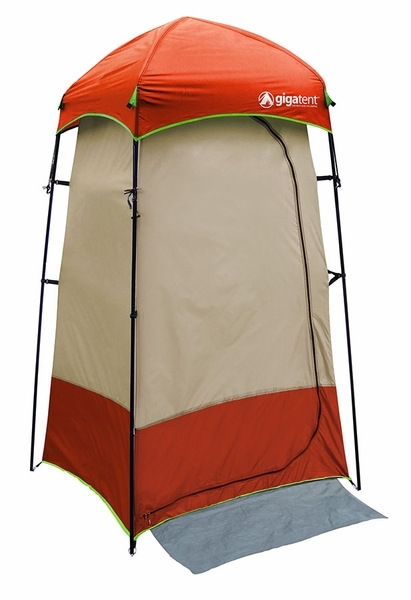 What color is the Gigatent ST 001D Stinky Pete Deluxe 4' x 4' Shower and Changing Tent? Is it orange or red? Per the manufacturer, the color is orange. Is the floor system all one piece? The floor is attached to the tent. There is no spacing between the floor and walls other than the netting. The floor is made partially of netting so water can drain out easily. Is there a place for a shower head to be slid into a side? Per the manufacturer, this has no slots for a shower head. Is this sturdy enough to hang a heavy solar bag in order to use it for a shower? This is an enclosure only, basically. We cannot recommend hanging things from it. Took it camping this weekend and it revolutionized our tent camping experience!! It made those 3 in the morning potty calls worth every penny. ConsStake loops are loosely stiched together. Broke one trying to pull out a stake. Since our camping trailer does not have a bathroom, this shelter was a great purchase for us. It housed our port-a-potty, and in the future will probably hold a shower as well. Effortless two-person set-up was an added bonus. The only negative was that one of the poles broke the second time we used it; however, the break may have been caused by staking it to the ground before assembling it. Regardless, this is a fantastic and useful product that I highly recommend to anyone whose tent or trailer does not have a bathroom. I wont be using this tent seriously for a while, but so far Id give it a glowing review! Set-up was very easy. One of the fiberglass poles broke when I was first putting the tent together, but I was able to replace it easily. Although there are a couple drawbacks (namely, it doesn't hold a five pound shower bag and definitely requires at least two people for assembly), overall this shower has worked beautifully. Just a side note: the cover is a necessity to give added stability. We have used this shelter on three camping trips, and so far it's been great for us! I should have heeded other peoples opinions on this Stinky Pete Private Shelter Tent. It certainly seemed like a good idea and I wanted to give it a try, but the fiberglass poles snap too easily! It was a waste of money. 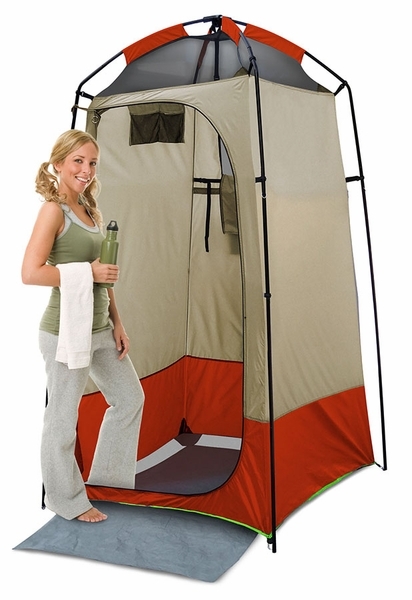 This is a superb portable and private shower shelter for camping in the great outdoors. It works great even though you need to squat down while showering or the shower bag is in your face. It does take two people to put it up but holds its own in high winds.